There was a multi faith Service of Dedication here at NHM on Tuesday 14th November led by the Bishop of St Albans, The Right Rev’d Dr Alan Gregory Clayton Smith which marked the Official Opening of the North Hertfordshire Memorial Park and Crematorium site. 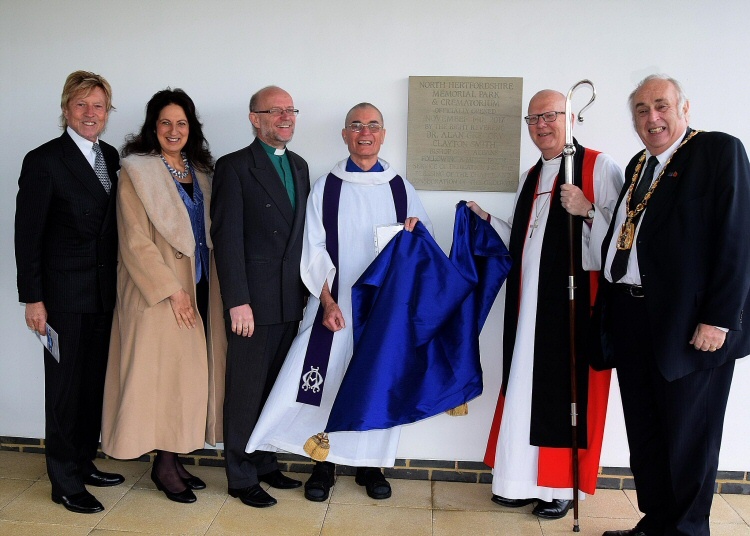 The Bishop unveiled a plaque marking the occasion after the service had finished. Pictured (from left to right): Howard Hodgson (CEO, Memoria), Robby Evans (Civil Celebrant), Rev’d Andrew J Henton Pusey (Walsworth Road Baptist Church Hitchin), Father Tom O’Brien (Our Lady’s Catholic Church Hitchin), Dr Alan Gregory Clayton Smith (The Right Rev’d Bishop of St Albans) and Councillor Alan Millard (Leader of the North Herts District Council). © North Herts Memorial Limited, 2016-2019 ~ all rights reserved.